UPDATED I have been a user of WebOS based devices for a couple of years now, I bought a Palm Pre in late 2009, and a Touchpad on launch day. WebOS in general has been a pretty good user experience, it worked quite well from a functional perspective in my view. The devices weren't the fastest(though since I really never used any others I had little frame of reference), I think mainly to the web-centric nature of the OS instead of running mostly native code. The Pre was my first Palm-branded product, though I did own a couple of Handspring Visors for a long time. WebOS seems to have been, for the most part widely praised from a user friendliness angle from a wide selection of folks, though that alone wasn't enough to carry the platform forward for HP. Myself, I had a firm belief that HP was committed to the platform for the long run - at least 2-4 years before making any decisions about the future. Primarily because of the situation of the market. With Microsoft, Nokia, and RIM all struggling in one way or another, and wide fragmentation of Android leading to, from what I've read, poor user experiences on the platforms (granted there are probably some really good ones but given the number of Android devices it appears most of them are pretty bad). There was, and still is room for someone to play in the space with a unique product offering. I can only assume the new leadership at HP just didn't agree with the previous leadership which is too bad. I mean it doesn't take a rocket scientist to realize it's going to take multiple billions of dollars of investment to build up such an ecosystem, you don't need an army of consultants and market analysts to figure that one out. Unfortunately for Palm, WebOS, and the user base the new management didn't want to commit to the platform in the way they needed to in order to drive it. The best comparison I have I think is perhaps Microsoft - they have been in the mobile phone space in one form or another for more than a decade, and they have low single digit market share to show for it -- but they haven't given up (and it looks like they won't either). I felt that same level of commitment from HP early on, unfortunately I guess the folks that make the big decisions decided to change their mind and cut their losses(either that or the people that make the big decisions themselves got changed out). It wouldn't surprise me if the current HP management wouldn't of been willing to pay the $3 billion for 3PAR either if they had that opportunity today. Well I'm glad HP has 3PAR -- if for nothing else it kept them out of the hands of Dell. Their quarterly report today mentioned "triple digit growth" for the 3PAR platform, which in general is kind of confusing - I mean it seems most everyone is reporting massive storage growth -- this can't all be net new storage -- someone has to be at the losing end of it -- who ? HDS ? IBM ? (I haven't noticed either talk too much about growth but I haven't tried to look for their comments either). Maybe in 3PAR's case most of their growth is at the expense of EVA(which should just go away), I haven't tried to find details. From the folks I know at 3PAR it certainly seems like they can't keep up with demand. The news that they are killing WebOS is quite sad to me, it was a platform with a lot of promise, it just needed more work - I have no doubt they were short handed and rushed to market with many things which hurt them -- but it was a choice, either release something now, as a sort of stop gap, or wait 6-12 or maybe even 18 months and release something good. You lose either way (at least until you have a polished end-to-end system) but I think the strategy they chose they "lost" less. You have to keep the news coming, the products coming etc. I plan to keep my Touchpad myself, and if I see a fire sale on them will probably pick up more, it's a good device, I've been using it pretty much daily for casual use since I bought it and really have very few complaints (even before the 3.0.2 OS upgrade). If the Pre3 does come out in some form (un clear whether or not they ever manufactured it), I'll try to pick up one/more of those as well - I'd assume no carriers will sign on to sell it, so the only way to really use it would be unlocked, on a GSM network. That is assuming that the device isn't a total brick. I was happy with the functionality I got on my original Pre with WebOS 1.4, in some cases I'm not hard to please (hey - I've been running Linux as my primary Desktop since ~1997 if that gives you any idea). The 64GB "4G" Touchpad was supposed to launch soon, but now who knows - I suspect the launch will get canned. Even if HP continued WebOS development I have no doubt the Pre3 would struggle to find relevance in the market given it's late arrival. Most folks were expecting it months ago - the most recent estimations put it at mid September - right smack when the iPhone 5 is supposed to launch, as well as the free iPhone 3GS. As time has gone on the Pre3 hardware has gone from looking really good to nothing special. Compound that with the fact that HP apparently wasn't going to use the next generation WebOS 3.0 on the Pre3, instead using the older generation of WebOS software with a completely different SDK, I suppose it wouldn't be too far fetched to say the Pre3 was going to be mostly DOA, performing no better(perhaps worse) than previous WebOS devices due to the poor timing of it's release. I have struggled to try to think of why it was taking them so long to get the Pre3 out the door, especially since they weren't going to use WebOS 3. I'm not expecting anyone else to pick up WebOS -- instead I think others will just mimic it's functionality on their own platforms - sort of like how RIM did with the multitasking on their Playbook tablet. What was more surprising to me in general was that tablets in general are not selling. As many people have said - there really isn't much of a tablet market out there - there is an iPad market, but not much of a tablet market. I have read things recently that seem to indicate almost all of the Android tablets are faring even worse than the HP Touchpad was - Android as an aggregate has been doing fairly well but the individual companies pitching their tablets - the sales are quite poor in general (with a couple of standout exceptions), There's gotta be what - 50+ different Android tablets on the market now? I'm really too sad to be mad at this point, I have no regrets in buying into the platform - it's more sad about seeing such a promising platform be killed prematurely. UPDATE - Barely 24 hours after they kill the platform they launch the 64GB White Touchpad for a mere $599. 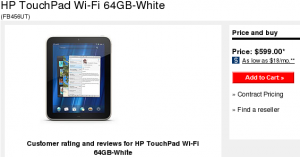 The 64GB "White" Touchpad - what they don't have Photoshop? Or maybe they just don't care. I guess not everyone got the memo yet.